Galle is best known among photographic circles for the “stilt fishermen.” These are subsistence fishermen who sit for hours on stilts in the shallow surf, casting their lines for palm-sized fish. There used to be hundreds of men making a living this way, but the tsunami of 2004 killed off most of the fish, and they are only now starting to return. There are a couple of spots along the coast where men sit on stilts solely for the purpose of charging a fee for photographing them. Our guide took us to the last group of men who actually fish for a living. We visited this site three times — twice at sunset and once at sunrise. The scenes above were mostly taken as long exposures, giving the dreamy image of the ocean as the surf ebbs and flows. 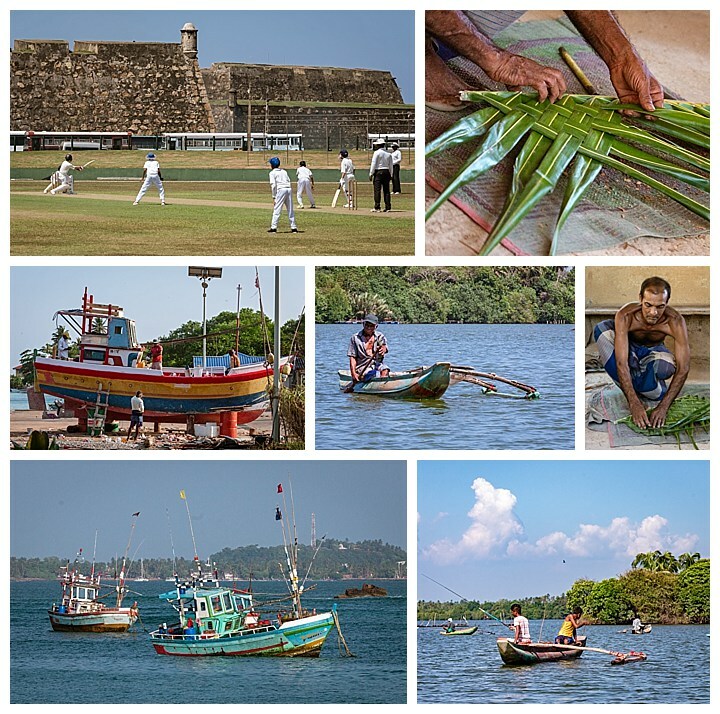 While the stilt fishermen were the reason for visiting Galle, we did some other exploring around town. While most of the group visited an old fort, I decided to watch a cricket game instead (upper-left), since I had never seen one before. We visited a small cinnamon-making demonstration where the owner also showed us how to make frond roof thatches (upper-right and middle-right). We also had a chance to witness people repairing a colorful boat (middle-left), and fishing out of small outrigger boats (middle and lower-right). This brings us to the end of our Sri Lanka tour. As always, Mehmet Özbalci put together a first-rate trip, even though this was advertised as a scouting trip, where he was exploring the best places to go for future tours. Tomorrow we fly to Tehran, Iran, where we will again follow Mehmet for another two weeks. Stay tuned!